YOH and Tao Ren’s fight during the second round of the Shaman Fight concludes in this volume. Greatly affected by Yoh, Ren goes back to China determined to change the way his family sees the world. But a giant obstacle stands in Ren’s way – his father, the most feared shaman in China! When Yoh gets word that Ren’s in trouble, he’s off to save him. Hiroyuki Takei develops each of his characters well and creates new interesting ones each volume. Effort is made to explain their backgrounds and unique personalities. Manta is still the funny, short boy full of nervous energy who turns out to be a great friend. Amidaru, once a feared samurai, is now Yoh’s loyal ghost partner. And Ryu, a local gangster with an outrageous Elvis pompadour, is found to have latent shamanic powers and is now part of Yoh’s circle of friends. Besides the three, there are many more that make Yoh’s quest to be the next Shaman King so memorable. It is fun to see some of the comical expressions. Manta and Amidaru’s occasional exaggerated shocked expressions never fail to crack me up. Drawing space is not wasted in each page and the story and humour is such that you just can’t wait to see what happens next. Throughout the volumes you are also introduced to various religious and cultural traditions. Hiroyuki Takei won Japan’s Hop Step Award (monthly award given by Shonen Jump for amateur mangaka) and Osamu Tezuka Award. 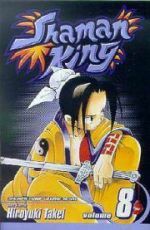 Shaman King, which debuted weekly in Shonen Jump Japan and USA magazine back in 1997, has also been adapted into a 64-episode series directed by Mizushima Seiji, who also helmed Full Metal Alchemist.